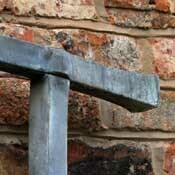 Unlike "drawing down", where the material is thinned when hammered, "upset" metal is thickened. 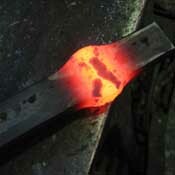 This is performed by heating, then hammering the end of a bar into itself so that it swells out. The weight of a large bar can be used to do the forging if is held vertically and repeatedly dropped onto an anvil to spread the metal. The bar can be thickened anywhere along its length by locally heating the relevant area, before striking the bar. Some examples of upsetting are discussed below. This bar is upset away from its end using localised heating. The swellings formed will be used to make the shoulders of a mortise and tenon joint. 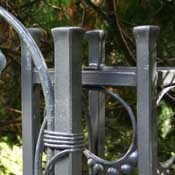 Upset finials are used here as decorative elements of a gate frame. 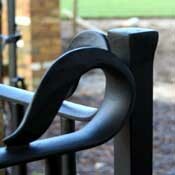 This balustrade uses an upset handrail. 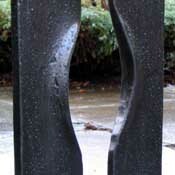 This post is used to join two railing panels. 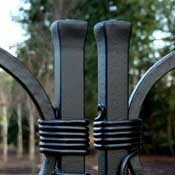 This cluster of upset bars is part of a lattice gate post. 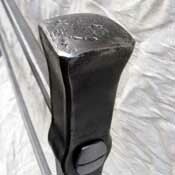 A very heavy duty bed post with an upset finial. 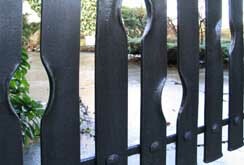 The "holes" in this gate and the swellings beside it are formed by upsetting the bars so that the metal moves sideways. 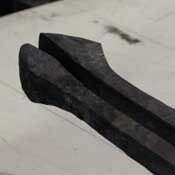 The posts were first upset, then drawn down to provide a more defined shape to the finials.